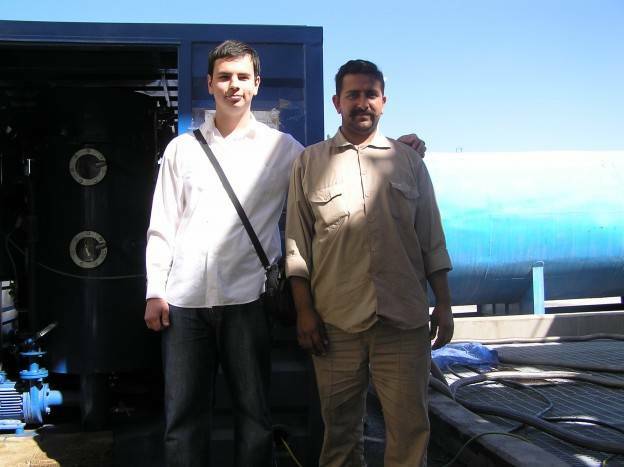 GlobeCore’s engineer with a collegue from Saudi Arabia after successful start of equipment - ! Equipment for Transformer Oil Reclamation. GlobeCore. The choice of the plant was far from random. The CMM-10 is a versatile unit, allowing heat and vacuum treatment not only of transformer oil, but also turbine, industrial and other oils. The oil is restored by removing water, gas and various solid particles. The CMM-10 plant has a wide range of application. If can be used for installation, repairs and operation of oil filled high voltage equipment, sealed or breathing. up to 1150 kV. Besides, the CMM-10 can successfully heat equipment with hot oil, introduce nitrogen into the oil and add oil into high voltage systems. The unit is protected from overloads, overheating and short circuit of controls, pumps, drives, lights and heaters. The CMM-10 stops in case of phase skipping, incorrect phase connection, as well as overheating of oil from or the oil heater. Light and sound alarms are available. The plant is simple in operation and can be used both indoors and outdoors.